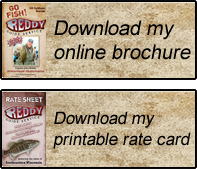 Reddy Guide Service - Fishing success in the Geneva Lakes Area, including Lake Michigan and Green Bay! Fishing success in the Geneva Lakes Area! The Lakes Area of Southeast Wisconsin is one of the best fisheries in the midwest. Lake Geneva, Delavan Lake, Lauderdale Lakes, even Lake Michigan -- they're right here in our back yard with fish waiting to be caught.